Upper-Shen Mountain or Shangshen is a rugged, rocky peak with no vegetation on it, but there are hazelnut groves at its base. There, Danghu birds can be seen flying from branch to branch. A danghu looks like a pheasant, but it flies using its hypertrophied whiskers and throat feathers. Consuming a danghu protects from and cures myopia. Guo Pu extolled the virtues of the danghu, using it as a metaphor for the economical mindset of Daoism as it makes do with what it has. Mathieu suggests that this bird is the masked Japanese grosbeak (Eophona personata), which is nonetheless unwhiskered and unpheasantlike. According to the Guideways through Mountains and Seas, the animal known as Bo can be found around Mount Winding-Center (identified as Mount Xue), where Huai-trees grow and where jade, realgar, and metals are plentiful. It can also be found on the plains of Mongolia and on islands in the Northern Sea. The existence of bo in the district of Shen Su was unknown to its residents, until a man called Leu Chang informed them by quoting the Shan Hai Jing for good measure. A bo looks like a horse with a white body and a black tail, with a single horn on its head. It has tiger’s feet and saw-like tiger’s teeth, and makes a sound like a rolling drum. Bo are strict carnivores that feed upon tigers and leopards, although other sources state that leopards eat bo, and bo in turn eat tigers. A bo will protect against weapons if its flesh is eaten, or if tamed and used as a soldier. Bo are just and honorable animals, and will reward virtuous behavior accordingly. When the wise magistrate Chung Wa of the Kingdom of Peh Chi faced an invasion by a large number of carnivorous wild animals, six bo appeared and slaughtered the beasts in thanks for the magistrate’s goodness. 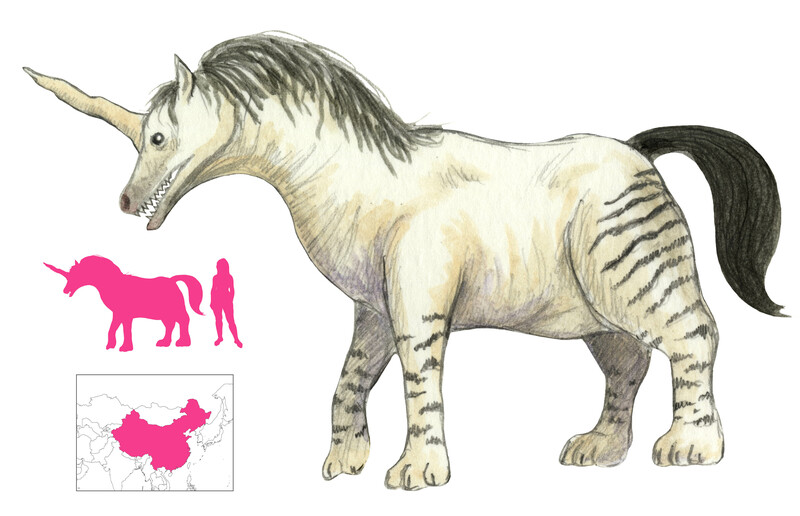 Duke Huan of Qi’s horse looked like a bo, according to his prime minister Guan Zhong, but presumably did not eat tigers. Gould, C. (1886) Mythical Monsters. W. H. Allen and Co., London. 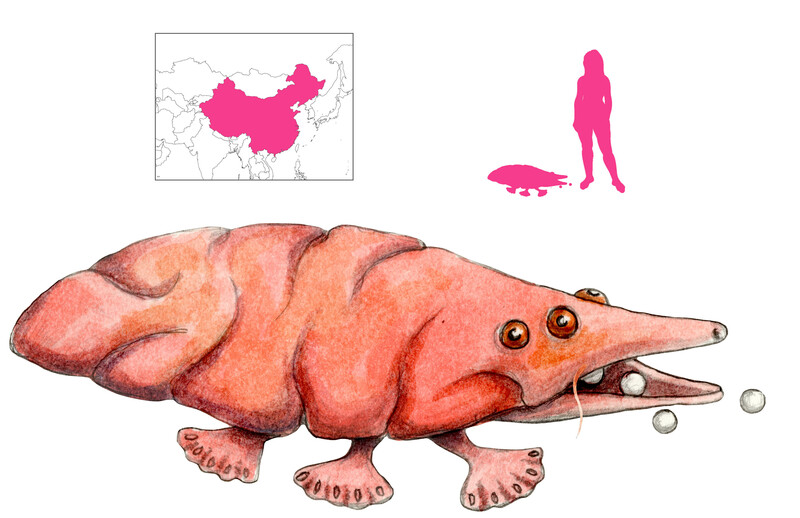 The Bingfeng is an odd creature from the Guideways Through Mountains and Seas. 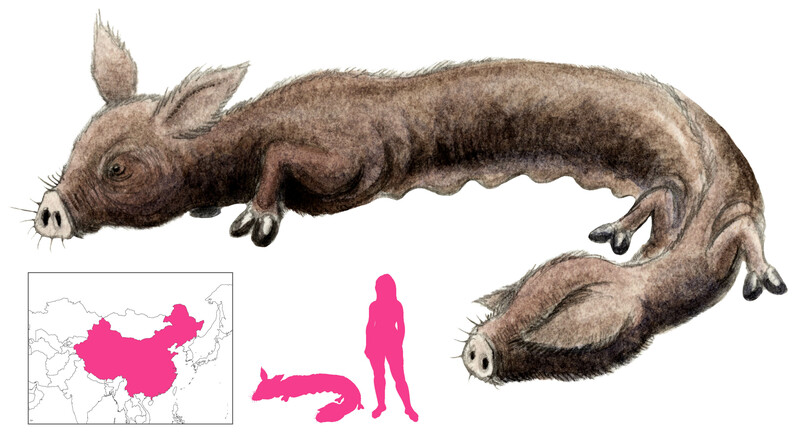 It looks like a black pig with an elongate, tubular body, and it has two heads, one at each end. It may be found in the land of Shaman Xian. Borges, who referred to it as the Ping-feng and sourced it from the T’ai Kuang Chi, located it in the land of Magical Water. Guo Pu speculated that the presence of two heads would have made the bingfeng extremely stubborn. Wen Yiduo, on the other hand, believed the heads were symbolic of hermaphroditism, representing the separate sexes. 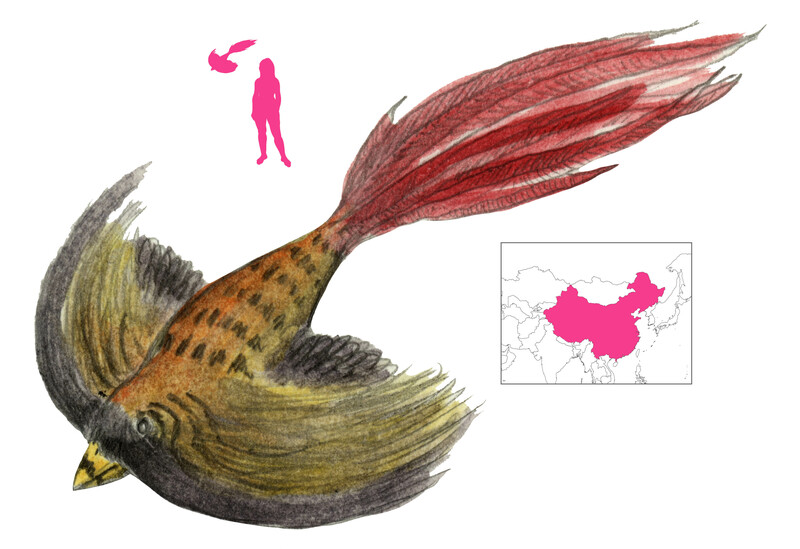 A number of other two-headed Chinese animals have been recorded, but they have not been described in much detail. Their symbolism is assumed to be the same. 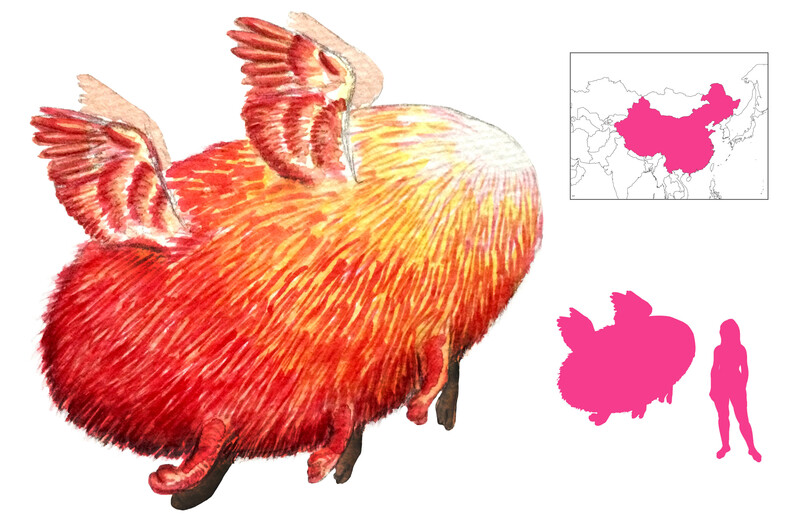 The Pingpeng, found on the mountain of Aoaoju in the Great Wilds to the West, is very similar but has two heads left and right, instead of front and back. It is probably the same animal as the Bingfeng. The Chuti, or Ch’ou-t’i according to Borges, is found in the Great Wilds to the South between the Red River and the Desert of Shifting Sands. 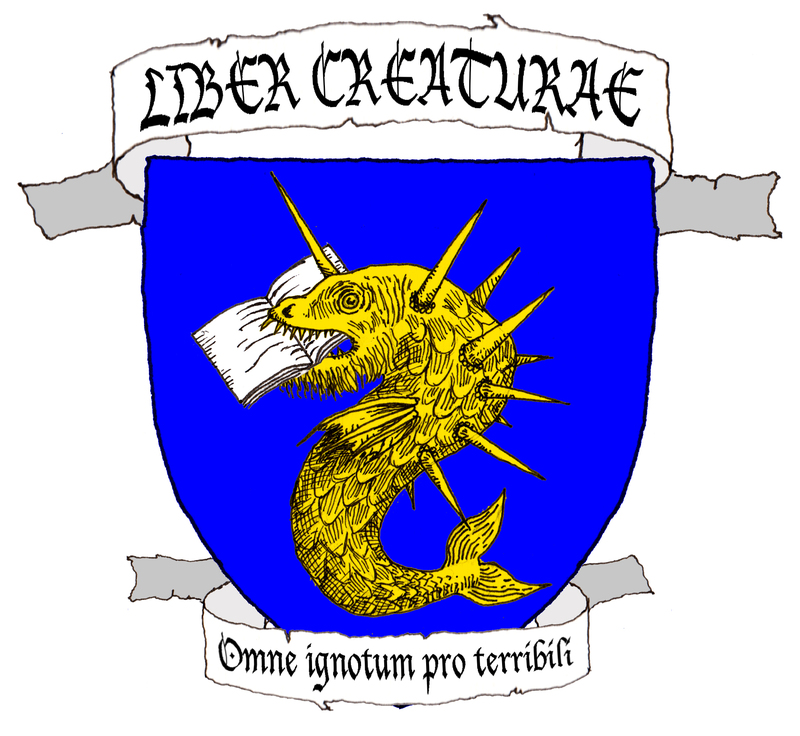 It also has two heads left and right, and is depicted with doglike features.